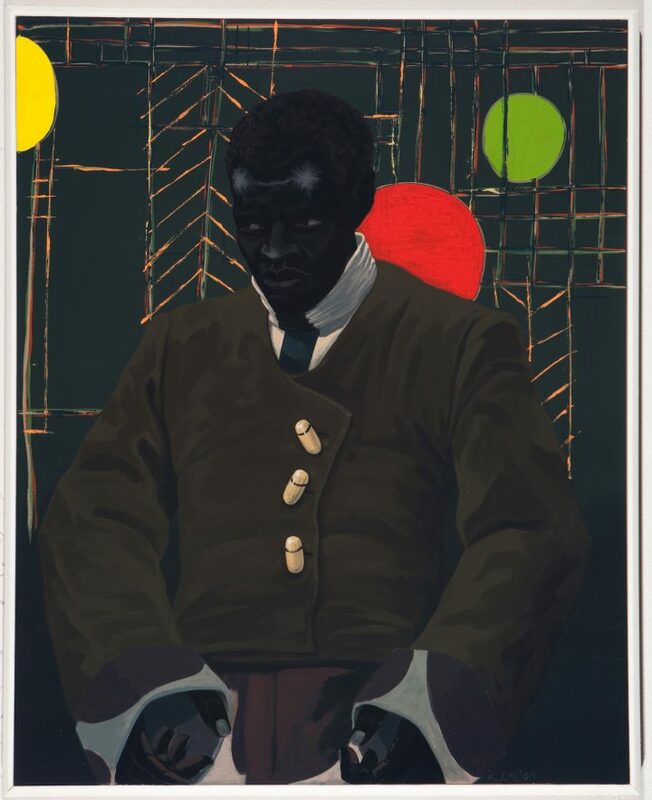 Like Ralph Ellison, who did not think of the Invisible Man as a protest novel, Kerry James Marshall is interested in the nuances of invisibility, in how much goes unseen, and the many different ways willful blindness manifests itself. Two days later, after the election results began appearing on screens all across America, it was clear that the old normal had replaced the “new normal,” that whatever “breakthrough feel” existed before Election Day had been halted in its tracks, that the days of terror and fear were going to begin again, not that they ever went away for many people. It is this fear — as well as happiness, desire, love, anger, remembrance, and frustration — that Marshall grapples with in his work. What he possesses is an ability to render a wide range of complex and even contradictory feelings into paint — to be simultaneously intricate and direct. Kerry James Marshall was born in Birmingham, Alabama, in 1955, one year after the Supreme Court overruled the Plessy vs. Ferguson decision— which upheld state segregation laws — by awarding a victory for the civil rights of African-Americans in Brown vs. the Board Education. The Court ruled in 1954 that separate but equal is not equal, which offered many people hope for the first time. In 1963, the artist’s family moved to Watts for a year before moving to South Central, Los Angeles. The Watts riots began on August 11, 1965, in response to what many believed was police brutality and lasted five days. Thirty-four people died. I went from floor to floor looking at everything, in the same way that in the library I went down the stacks and looked at every art book, without discrimination. He was a sponge soaking it all up, at once innocent and hungry. One lesson he took away from this experience, a lesson that has driven his work, was that there were no paintings of black people on the museum’s walls. No one he saw looked remotely like him, a situation that he has dedicated his life to rectify. This story, which is known by anyone who has more than a passing familiarity with Marshall’s work, bears retelling. So my task was one of revealing the human universals hidden within the plight of one who was both black and American. This is the task that Marshall set for himself. Like Ellison, who did not think of the Invisible Man as a protest novel, Marshall is interested in the nuances of invisibility, in how much goes unseen, and the many different ways willful blindness manifests itself. In “A Portrait of the Artist as a Shadow of His Former Self,” Marshall limits his palette to blacks and grays, except for the whites of his eyes and his teeth, one of which is missing. This face looms in the darkness, almost ready to disappear back into it. 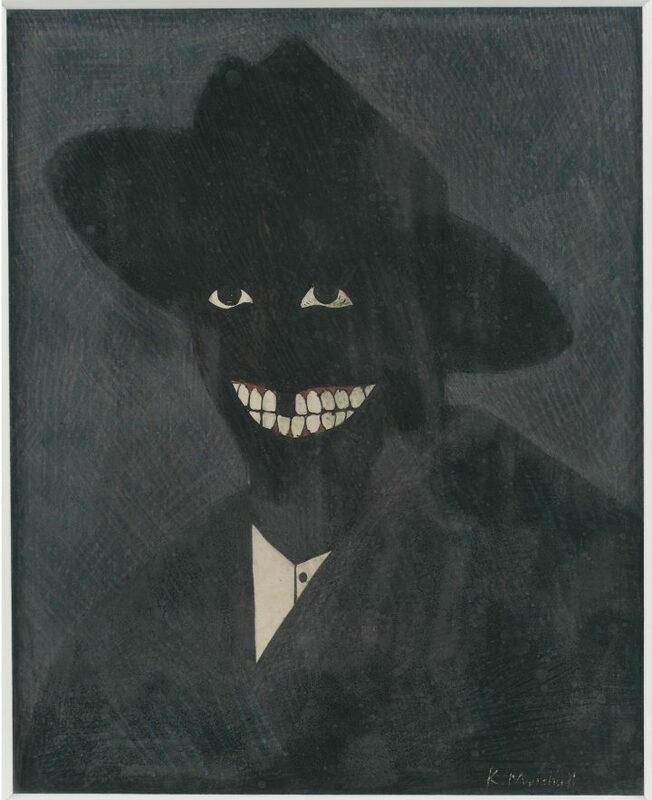 This is a portrait of the black man as caricature, which is a kind of shadow. As to his former self, what happened to it? Or has it, in the age of the death of the author and the self, become a permanent absence to be replaced only by caricature, parody, and citation? How do you cite a black body if there is none to be found? In “Portrait of the Artist & Vacuum” (1981), he depicts his portrait alone on a red wall behind an unplugged vacuum cleaner, evoking the long history of people of color working to maintain someone else’s home. And yet, the presence of the portrait leaves open the question: whose home is it? What also started to crystallize in that painting was a way to bring together not only Western traditions of pictorial representation, but folk traditions of painting that have an equally valid authority. I don’t see much difference between using Giotto or Bill Traylor as a point of reference. To me they’re the same. Their work has a certain power. I think that Marshall’s equating of Giotto and Traylor is central to any understanding we have of his work. 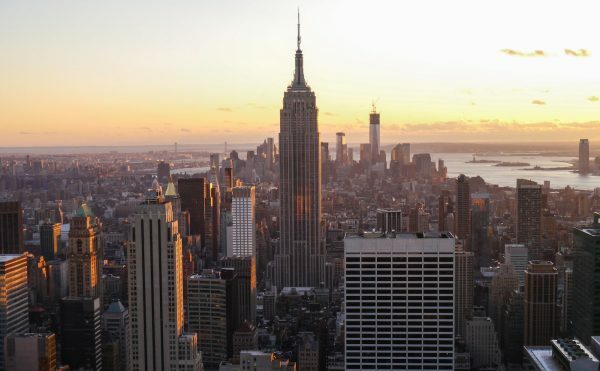 By rejecting the hierarchical thinking that establishes what is great and what’s minor, which is really an academic way of dealing with the world, the kind that enabled authorities to declare painting dead, Marshall challenges and breaks down these divisions — which are often along racial lines — in order to move forward. This is a big show taking up two floors of the museum. Turn a corner and you will be surprised, so much is packed into the exhibition. 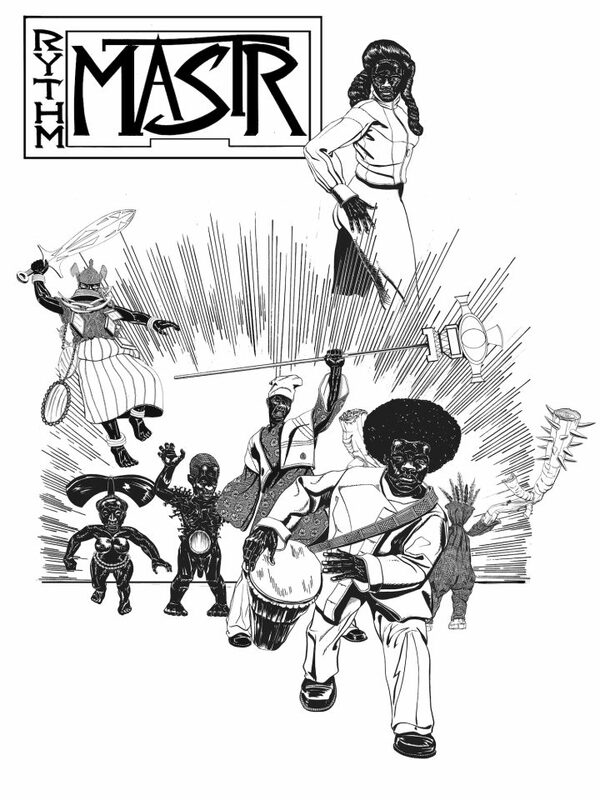 It includes early collages, paintings, large illuminated panels from his comic strip of a black superhero, “Rythm Mastr,” an installation of his photographs, and a selection curated by the artist from the Metropolitan’s permanent collection titled “Kerry James Marshall Selects.” One thing missing from the show is Marshall’s sculptures. I also wish there was more information and space given to the comic strip. But, in Marshall’s curated selection, to see works by Charles White, Horace Pippin, Georges Seurat, Jean-Auguste-Dominique Ingres, George Tooker, Willem de Kooning, woodcuts by Yoshitoshi, photgraphs by Roy DeCarava, and a Senufo oracle figure, in the same room — with no hierarchy — was great. Artists — at least the ones I know and respect — don’t distinguish between minor and major, self-taught or otherwise. They love art and don’t focus on status or position. In his merging of medium and subject matter, Marshall recognized that he had to insert himself into a history that was declared finished, and therefore closed off to him and to others — women and artists of color. 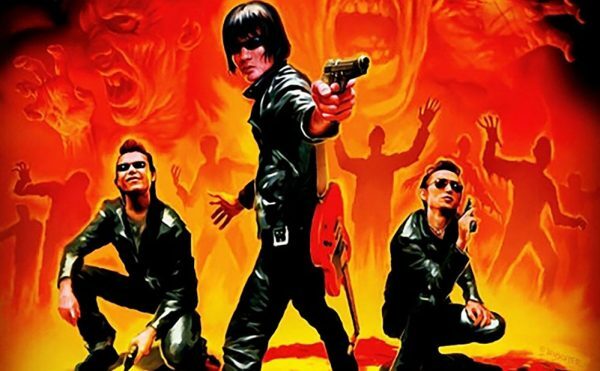 The authorities (or are they the authoritarians?) who pronounced painting to be dead lived in a bubble: they refused to recognize how neatly the narrative they kept spinning fit into the erasures and belittlements characterizing America’s modern era. This era is marked by the Dred Scott decision (1857), the Chinese Exclusion Act (1880), Plessy vs. Ferguson (1896), Hollywood’s denigration of blacks and Asians throughout its history, President Roosevelt’s executive order (February 1942) ordering the relocation of all Americans of Japanese ancestry to internment camps, the Supreme Court Court’s overruling in 2013 of key parts of the Voting Rights Act (1965), and the election of Donald J. Trump as President: white fear turned into the new normal. But what’s normal for some is hell for others. This is why Marshall’s achievement is nothing short of miraculous. Amidst all the pronouncements of the death of painting, and the celebration of the latest accommodation to the narrative of painting’s death, Marshall has refused to eat from the hand he has been offered. He has tackled social history, portraits, and history painting, and has concocted figures from his imagination. He doesn’t sugarcoat history either. 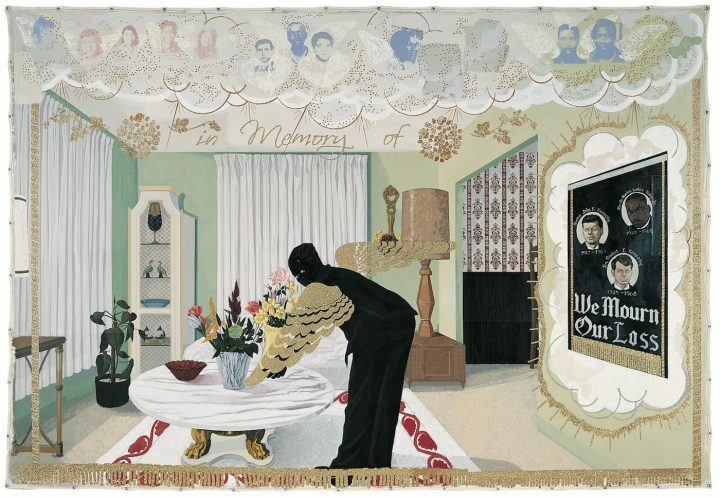 In the painting “The Actor Hezekiah Washington as Julian Carlton, Taliesin Murderer of Frank Lloyd Wright Family” (2009), Marshal depicts an imaginary actor as Carlton, who murdered seven people with a hatchet and gasoline. In this day and age, Carlton, who died of starvation while in jail awaiting trial, would be classified as a mass murderer. He never revealed why he committed the murders, and all sorts of theories have been advanced. By portraying an imaginary actor in the role of Carlton, Marshall returns to the theme of invisibility from another perspective. Can we ever know what motivated him to do this deed? And yet, Marshall affords Carlton a certain dignity and mystery: we cannot see into his angry soul. In the 1990s, Marshall began painting large group portraits on unstretched canvases outfitted with grommets for hanging on the wall — complex tableaux that can taken down and rolled up. The unstretched canvases, which remind me of tarpaulins, underscores Marshall’s sense that all this might be temporary, that these paintings might soon be rolled up and put in storage. Marshall uses three combinations of black to depict his subjects: carbon, ivory, and Mars black. His characters are simultaneously actual figures and symbols, most likely because Marshall, like Ellison before him, felt that realism was too limiting. Any truth he would get at would have to be through fiction, the fusion of something he witnessed, studied, and imagined. Marshall is a history painter but not a documentarian. All through the ‘90s, Marshall turned out one majestic painting after another. Prepare to be dazzled, shaken, stirred, challenged, and disturbed. Marshall can be tender and sweet; he can memorialize the dead (from children to Presidents and Civil Rights leaders); he can praise beauty and rewrite history; he can evoke histories and events that have been neglected or glossed over; he can be sardonic; he can evoke fear and embrace anger; and he can be enigmatic. At no point did I feel that he was calling attention to himself or saying, I suffered or felt this. If anything, Marshall has found ways to expand his subjectivity and memories so that the self takes at least one step back. In contrast to Walt Whitman, he embraces multitudes without using “I.” This is what he shares with the great figurative painters, starting with Jean Auguste Dominique Ingres, and including Manet, Georges Seurat, Paula Modersohn-Becker, Frida Kahlo, Jacob Lawrence, Horace Pippin, and Willem de Kooning — an interest in the body, the individual, and groups. 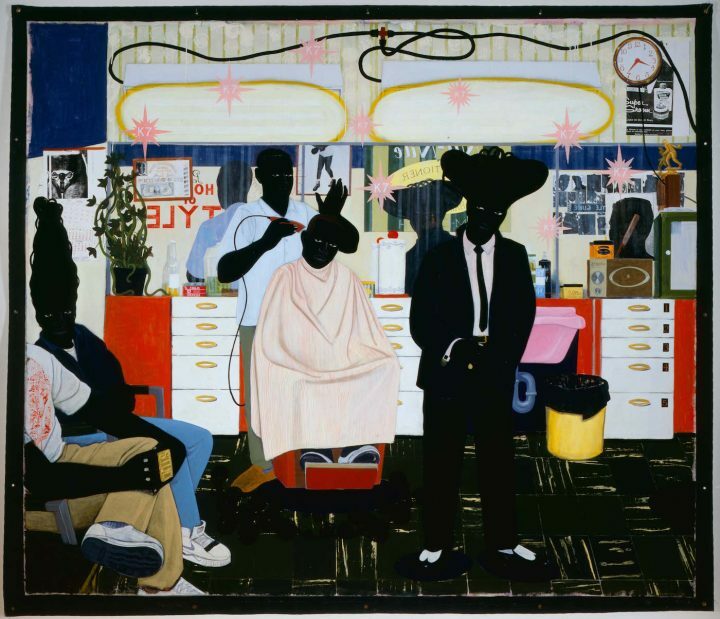 In “De Style” (1993), a breakthrough painting which measures around ten by ten feet, Marshall depicts the interior of a neighborhood barbershop. There are three men more or less occupying the center of the painting, with rays extending out from the barber’s head, suggesting that he is a saint of some sort. 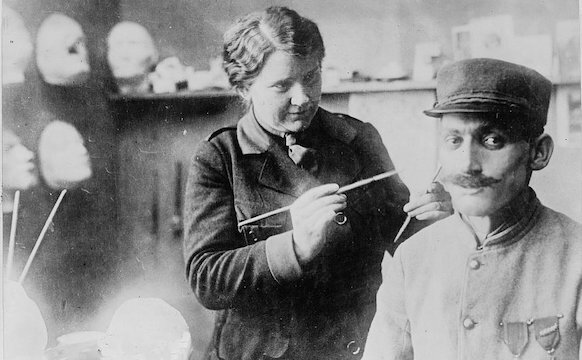 On the left, a woman is seated, looking out at the viewer. Her mountain of hair alludes to a traditional African style while being contemporary American at the same time. Seated next to the woman is a partially visible man, whose right hand is adorned with a sleek ring with the word “STUD” spelled out on it. The painting’s title is a reference to the stock and trade of an actual barbershop as well as a homophonic play on the Dutch utopian art movement “De Stilj” which posited the use of horizontals, verticals and elementary colors, including black and white, in search of universal principles. The barbershop’s name, “Percy’s House of Style,” is partially reflected, in reverse, in the mirror behind the barber, where we also find a master’s certificate issued by the Mid-City Barber’s College. This is a world — from the partially visible photograph of the boxer Joe Louis, nicknamed the “Brown Bomber” to the flyer for “Super Groom” to the “style guide” of head shots behind the Zenith radio — where no white people are present, and, more importantly, where none of the inhabitants seem the least bit concerned about this. The shallow space and the placement of the bodies within it deliberately links the painting to Rembrandt’s “The Syndics of the Drapers’ Guild” (1662), his first and only corporate group portrait, while the use of red, white, and two shades of blue (along with the painting’s title) alludes to Piet Mondrian and Theo van Doesburg and the beginnings of Dutch modernism, as well as the American flag. Rather than looking back, or being wistful or ironic, Marshall synthesizes these precedents, bringing them into the present. In contrast to Rembrandt’s painting, which depicts only men in the group, Marshall includes a woman in his gathering. Nothing is frozen, and everything can change and be changed. This means that painting isn’t dead or even exhausted. Until the art world recognizes that, it will still place Marshall in a special category, and frankly that’s ridiculous and even racist. He increases our understanding of what can painting can do. Marshall’s love of detail, no matter how banal, animates his paintings. From the poster of Chris Offili’s exhibition at the Tate, to the paint-covered sign welcoming people to a housing project, to song lyrics unfurling across the painting’s surface, to the wallpaper, furniture, and decorative pottery, to an oversized painter’s palette, to the bloodied head of a white man lying on a pillow — everything feels urgent and necessary. 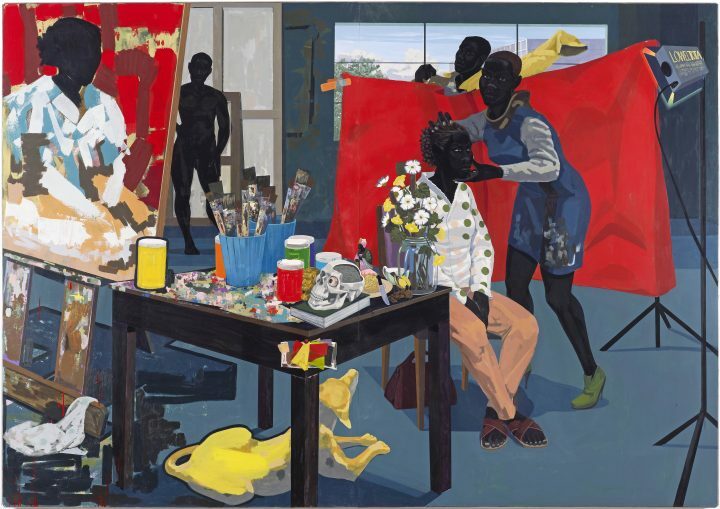 When Marshall includes an unfinished “paint by numbers” portrait being worked on by an imagined black artist, he quietly reminds us that these popular sets were pitched to the white consumer. For that company, people of color did not exist. If you think that such an absence had no effect on children growing up in America in the ‘50s through the ‘70s, I can tell you from experience that you are wrong. And if you think that such oversights are gone, think about the casting of Scarlett Johansson as Major Motoko Kusanagi in the upcoming movie, Ghost in the Shell. My 15-year old daughter and her friends have. 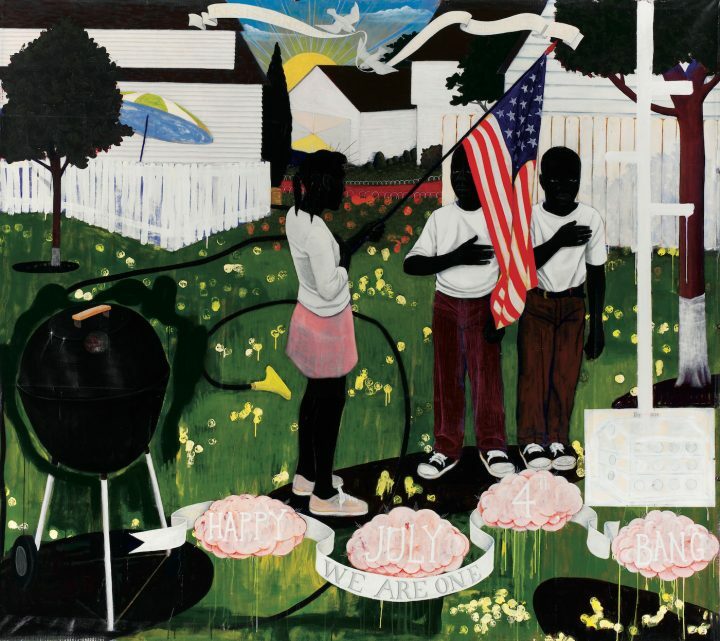 While many writers have praised Marshall’s “Garden” paintings, which they certainly deserve, I want to call attention to two works that have gained less attention: “Black Painting” (2003-2006) and “Red (If They Come in the Morning)” (2011). In the abstract “Red (If They Come in the Morning),” Marshall recasts Barnett Newman’s painting “Who’s Afraid of Red, Yellow and Blue III” (1967), one of four paintings he did with that title between 1966 and 1970, and which had been vandalized and restored. Marshall’s painting, which measures 8 feet by more than 17 feet, is done in black, red and green, the colors of the Pan-African flag. The colors symbolize blood and sacrifice (red), the color of the people (black), and the fertility of Africa (green). The phrase, “If they come in the morning,” which is barely visible, is written in different shades of red on the red ground that takes up most of the painting. The words emerge out of the red as well as sink back into it. The line is a rephrasing of a closing line from an open letter that James Baldwin wrote to Angela Davis while she was in jail, accused of aiding the prisoner George Jackson in his attempt to escape from a California courtroom. Known as the Soledad Three, Jackson, along with two other men, Fleeta Drumgo and John Clutchette, had been falsely accused of murdering a white prison guard in 1969. By inserting this sentence into Newman’s well-known painting, as well as changing the colors to the Pan-African flag, Marshall underscores the divisions in America. Newman, who identified himself as an anarchist, made paintings that denied space, figuration, gesture, and painterly incident. They were visceral feats of pure opticality. It seems to me that their vulnerability is also part of their meaning. 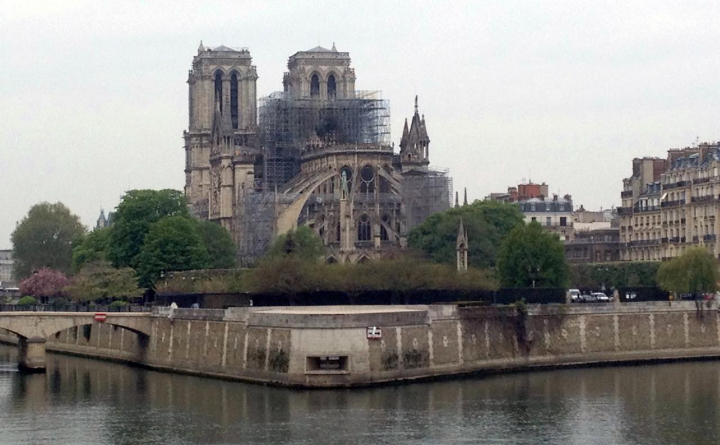 Critics define Newman’s works as art-about-art, attempts at attaining pure objectivity. They are regarded as a culmination. Jackson, who became a member of the Black Panther Party while in prison, was shot to death in prison on August 21, 1970, about six weeks after Newman had died on July 4, 1970. It was his second escape attempt. Davis was accused of aiding him in the first attempt and imprisoned for eighteen months until she was found innocent. I am sure Marshall knows all this and much more. By making Baldwin’s chilling words inhabit Newman’s painting, Marshall rejects the ideals associated with art about art: he presents a counter narrative, which starts with “A Portrait of the Artist as a Shadow of His Former Self” (1980) and continues to the present. I don’t think he is asking us to take sides. Rather, he is asking us to consider the merits of both. I would venture that by opening Newman’s painting back up, by literally and metaphorically inserting himself into it, he is challenging those who uphold the narrative that painting is dead, that it culminated in the silkscreens of Andy Warhol or that it was superseded by the stripes of Daniel Buren. It took me a long time to see “Black Painting,” which is Marshall’s redoing of a black painting by Ad Reinhardt. We are in a bedroom with no lights. The flag of the Black Panthers is discernible in the upper right-hand corner, above a dresser. There are two people in the bed, a man and a woman: we are in the same room as Fred Hampton and his girlfriend Deborah Johnson (also known as Akua Njeri), who is 8 ½ months pregnant. In a few minutes the Chicago police will burst through the door with guns blazing. 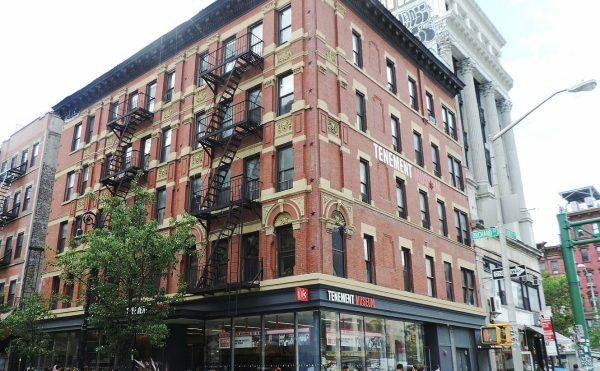 Two people were killed, Fred Hampton and Mark Clark, who was standing guard outside the room. This is what actually happened: on December 4, 1969, the Chicago police assassinated Hampton, who had been slipped barbiturates by an FBI informant. The crime scene was tampered with and the police involved lied, claiming the Panthers had been “vicious” and “violent,” none of which was true. At the same time, the F.B.I., under the orders of J. Edgar Hoover, was using a concerted program of disinformation to sow discord between various groups, including the Black Panthers, Young Lords, and Students for a Democratic Society. It wasn’t divide and conquer so much as divide and destroy. Who is to say it cannot happen again? In 1970, a lawsuit was filed on Hampton and Clark’s behalf. In 1982, a settlement of 1.85 million dollars was reached with the families of Hampton and Clark. Without any of the officials involved going to jail, the city of Chicago admitted guilt and gave the families money. This is the American way. It is called whitewashing. With President-elect Donald Trump’s appointment of Stephen Bannon— Breitbart executive and master of disinformation — to be his chief White House strategist and senior counselor, I wonder if Hampton’s assassination is a prelude to the new normal. Perhaps painting doesn’t make anything happen, at least not in any direct and obvious way. 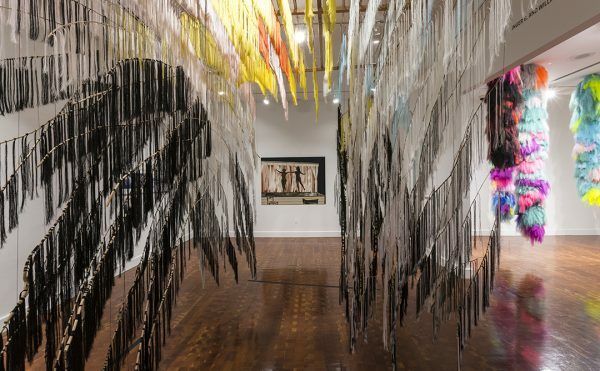 But it does have the ability to celebrate, mourn, and imagine the lives of black people — among the many things that Marshall’s work does — as it challenges us to open our eyes and see into the dark that is moving swiftly toward us. 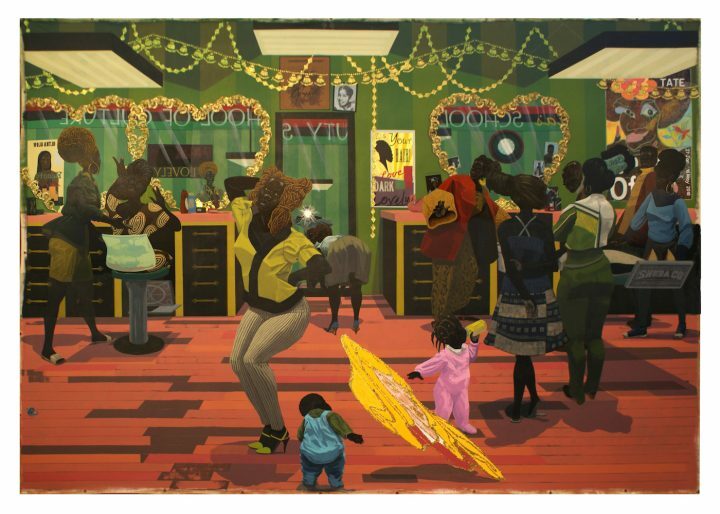 Kerry James Marshall: Mastry continues at The Met Breuer (945 Madison Avenue, Upper East Side, Manhattan) through January 29, 2017.